Where I'm at by the end of 2013. This is where I will post all my videos when I need some help! Hey guys, it's been about a week-and-a-half now. I thought I would post a quick video to share my progress and let you guys tear me up and help me fix my problems now before they become bad habits. No, I am not perfectly happy about my performance here, so it's alright, I'm ready for whatever bashing you have to offer. In fact, I challenge you to bring it! Also, this was recorded with my webcam, so sorry about the quality. For only 2 weeks in that is pretty darn good. I am watching your vid looking for things to point out but ??? not really finding any > I'm sure others will, I am still a beginner and don't know much. >> There seemed to be a bit of a rattle in the audio > is that sound quality or was that your instrument. I have heard that rattle on my viddle and had to make adjustments, that is why I am asking. Pretty darn good there wookieman > It will just keep getting better and better now. To begin with, wookieman / Jesse, this is not a bashing forum. Any tip's are meant to be constructive. I think you performed well for only two week's into it. Your violin sounded nice, very mellow. Couldn't see much of your right arm or your left hand and wrist due to the cam being a tad bit high, but what I could see looked good. Your intonation wasn't too bad with the exception of a couple place's you played kinda flat. It's ok though, you are a beginner and it will come in time. You've probably watched your own video several time's i'm sure, I've watched it 4 time's myself. Try to pick out and recognize where your note's are a little flat and see if you can fix them and then play the song again until you have it down, PAT. Good work, nice intonation! I like that You use almost all amount of the bow length! Wow. At less than two weeks in I could not have done that. Your bowing is very good. Nice and straight and long strokes. And as @Mad_Wed said, good intonation. Nice bowing..better than my two week mark by far. I like that you kept time the whole song and didn't rush it. wow, incredible... I never learned that tune when I started... that sounded beautiful. Long bow strokes... the key to good sound. Well thanks everybody. I really appreciate the support and feed-back. I will keep working on this one. I'm also currently working on the good 'ol "row, row, row your boat," so when I'm done with that I'll post another vid for your critiques. I may even do a montage of the two since they're both in the same key. Next goal after "row, row,.." is going to be the Star Spangled Banner in time for July. I've got a solid month, I think I can do it if I stay on it. Certainly going to be a challenge though. But hey, I like challenges. Thanks again guys! My latest video. Made this last night. I really enjoyed the challenge of learning both parts of a duet, recording them, and meshing everything together. I hope you all enjoy it. Feed back is welcome of course. very nice, I learned quickly in the beginning myself.. I think you'll make a great violinist !! Okay, this is a round of practice for the upcoming Fiddlerman Members Holiday Recital, so help me out. I know it still needs a lot refinement, so help me pick out some of the finer details so I can make it perfect before recording the final project. The only thing I think you need is more coughing like at :25 and :54. Hahaha. Seriously, I think you are doing a great job. Something that did jump out at me though was when you are playing on a high E-string position and doing an up bow, you seem uncertain. Not in the note, but in the stroke. It feels a little bouncy and unsteady like at 1:21. I may not be describing what I am hearing right, so maybe someone else can jump in. But with another month of practice, I'm sure you will knock it out of the park. Still waiting on my book. You are doing wonderful. Thanks for sharing the video. Good done, wookieman!!! Keep up that work! That was great, @wookieman. Well done for that much time into it. Alright everybody, to mark the end of my first year of playing (no, it hasn't been a full year, but you get the point), I couldn't think of a better way to showcase my growth than to play my own little recital. I hope you all enjoy, and feel free to offer criticisms. Merry Christmas Everyone! Fantastic. Imagine what you've accomplished in one year. Look forward to next years recital too. Thanks for the post, video, and Christmas spirit. Thank you .. what a lovely recital. You have done well. 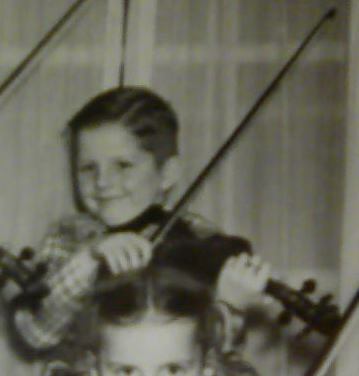 You are a good violinist now... and this year you will knock our socks off.Merry Christmas to you and Happy New year.